Irving equipment rentals from Texas First Rentals Irving. Rent aerial, power and whatever equipment it takes to get your construction job done. Visit Texas First Rentals Irving for your construction equipment rental needs. Rent the Cat equipment you count on for your toughest jobs, as well as, equipment rentals for Genie, JLG, Sullair, Wacker, Laymor, Vermeer and other top-notch construction equipment manufacturers. Texas First Rentals Irving offers specialty equipment like booms, and aerial platforms along with pumps, welders and concrete & masonry equipment and tools. Located in Irving, Texas First Rentals maintains and rents only the best construction equipment for the job. Texas First Rentals is a sister company of HOLT CAT, the largest Caterpillar dealer in the United States. The Holt family has been serving customers for over eight decades in the Texas market. We’ve learned the in’s and out’s of service, safety, quality, and high performance. 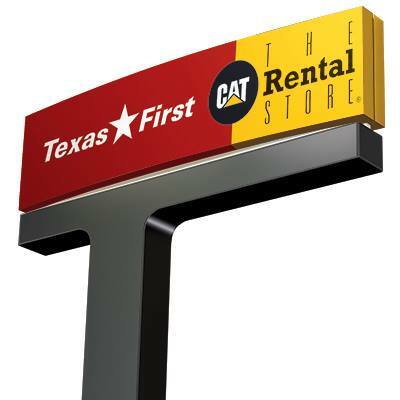 Texas First Rentals Irving offers daily, weekly and long-term rental options, equipment delivery and 24 hour emergency service. Call us for questions about financing, since we offer many financing solutions for your business. We have boom lift and scissor lift rentals, compressor and air tool rental, rollers and compaction equipment for rent, earthmoving equipment rentals including skid steers, bulldozers, track loaders and wheel loaders, telehandler and forklift rentals, excavators, trenchers and rockwheel rentals. Rent a dump truck, water truck, utility vehicle rental, pump rentals, concrete and masonry equipment rentals are available. We rent welders, light towers and generator rental – for construction projects and emergency power. Texas First Rentals Irving has heavy equipment rental, construction equipment rental, Cat Rental Store in Irving Texas, rent equipment, Cat rentals and forklift rentals, Cat rental, Irving construction rental, Cat equipment rental, construction equipment rentals, Texas rentals, HOLT CAT Rental, construction earthmoving equipment rental, tool rental, boom lift rental, scissor lift rentals, crane rental, plate compactor rental, rent vibratory rammers, trench roller rental, asphalt compactor rentals, rent vibratory soil compactor, rent air tools, rent a compressor, skid steer loader for rent, compact track loader rentals, backhoe rental in Irving TX, plus street saw rentals, excavator rental and even rent a wheel loader, dozer rental, rent bulldozers, rent trencher, rockwheel rental, buggie and cutoff saw rentals and light tower rental, generator rental or rent a generator from Texas First Rentals Irving, Grand Prairie, Arlington, Euless, Farmers Branch, Carrollton, Coppell, Duncanville and DeSoto Texas areas.